Fresh from announcing its new triple-SIM technology for Android smartphones, Taiwanese semiconductor company MediaTek has announced its latest piece of hardware: the MT8135 system-on-chip (SoC). Designed for high-end tablets, the MT8135 chip incorporates ARM’s new big.LITTLE MP architecture which allows both the power-efficient as well as high-performance chip clusters to work simultaneously. The MT8135 SoC by MediaTek consists of two chip clusters, namely a dual-core Cortex-A7 chip and a Cortex-A15 chip. The difference, as stated above, is the new big.LITTLE MP (which stands for heterogeneous multi-processing) architecture, and judging by the benchmark scores provided by the company, the MT8135 sure packs quite a powerful punch. 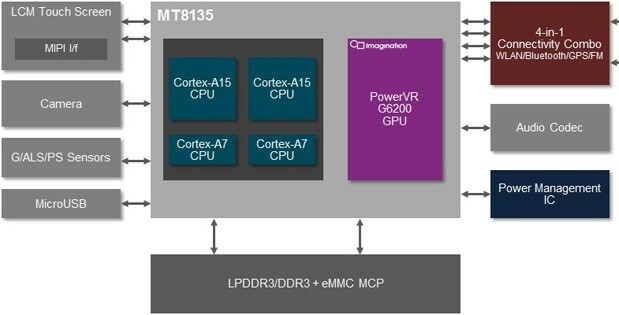 The video above, which details the MT8135’s benchmarking performance against other tablets running on competing SoCs, also shows off the graphics performance of the chipset, which is one of the first to be powered by Imagination Technologies’ new PowerVR Series 6 GPU, the PowerVR G6200. MediaTek did not disclose when its new SoC will make its way to premium tablets, but judging by the chip’s number-crunching prowess, it is safe to say that it can’t come soon enough.